Whittier Christian 51, Magnolia 31 — Justin Osborn and Jakob Williams both had nine points and Marco Gonzalez had eight points and five rebounds for the Heralds in a Buena Park tournament victory Tuesday. La Habra 1, Schurr 0 — Carlos Alatorre scored and goalie Daniel Toppen had nine saves in the Highlanders’ season opener. LONG BEACH — Tristan Meyer came to La Mirada High School four years ago as Erik Meyer’s little brother.He’ll leave next spring having carved his own niche in Matadore football lore. The younger Meyer, who leads the Matadores when they host Edison for the CIF Southern Section Division 3 title on Friday, will be the first La Mirada quarterback to start divisional championship games in back-to-back seasons. He’s also only one of three Matadores signal-callers to win a CIF-SS title, joining Daniel Poncedeleon, who did it in 2009, and his coach, Mike Moschetti, who won La Mirada its first CIF-SS title in 1992. Tristan Meyer helped beat La Serna for the Southeast Division championship last season en route to the CIF State III-AA title. Brother Erik Meyer guided La Mirada to the 2001 Division VI championship game. He then starred at Eastern Washington and the arena league. He also La Mirada’s quarterback coach. His dad, Kenny Meyer, has been La Mirada’s freshman coach for more than 30 years. “He’s great,” Moschetti said of Tristan during Monday’s CIF-SS Press Conference and Luncheon at The Grand Event Center. “His dad has been the freshman coach here for three decades. He coached me when I was a freshman. His brother was a great quarterback, so before he (Tristan) was walking, he grew up with a football in his hand, watching film. Tristan Meyer has had a lot of good games this season and last. He ranks among the passing leaders in the section with 2,208 and 35 touchdowns, and since moving into the starting role early last season, he has thrown for more than 4,000 yards and 62 touchdowns. He’s added his own chapters to the Book of Meyer. Tristan Meyer’s biggest attribute might not be his physical gifts, but his demeanor, which came into play two weeks ago when the Matadores rallied from a 21-point deficit in the second half to score a 32-31 victory over region rival La Serna in the quarterfinals. Meyer, with La Mirada trailing by two points, drove the Matadores 52 yards in the final minute to set up a winning 30-yard field goal by sophomore Brandon Petruescu with 12 seconds left. He keyed the drive with two fourth-down completions to Elijah Hicks, the second covering 30 yards to the La Serna 13. “That was a great game,” Meyer said. “La Serna was a great football team, and just coming back to win that game gave us a lot of momentum for these games (the semifinal win over Los Alamitos and Friday’s title game vs. Edison). It’s type of calmness with confidence that Moschetti likes about his quarterback. And now he hopes to guide La Mirada to consecutive CIF-SS titles for the first time in school history. In will also be the Matadores fourth CIF-SS crown in 11 final-round appearances. MONTEBELLO — Cantwell-Sacred Heart of Mary’s Jackie Vargas has been one of the area’s top softball players during the past three seasons, and she was rewarded Wednesday for that success. 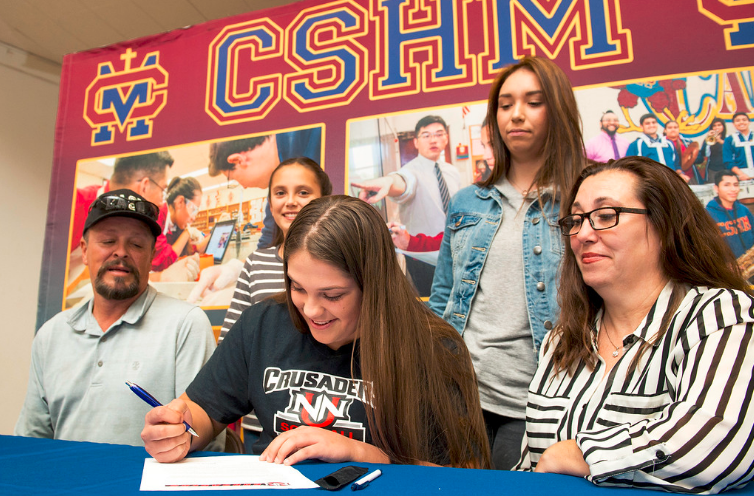 Vargas, a senior pitcher/third baseman, made her college choice Wednesday, signing with Northwest Nazarene, of Nampa, Idaho. The campus is close to Boise State University. “This is my dream come true,” Vargas said during a ceremony at CSHM. “It’s everything I’ve ever wanted, and now that it’s actually happening, it’s probably the best moment of my life. Vargas has had three solid seasons with the Cardinals. She led CSHM to the 2014 CIF Southern Section Division 6 title game, losing to St. Bonaventure, and earned All-Del Rey League each of the past two seasons. She was also the Cardinals team MVP last spring. She will join NCAA Division II Northwest Nazarene, which was 17-29 last season while competing in the Great Northwest Athletic Conference. Vargas is not looking forward to living far away from home, but she does believe she will transition to that. The Crusaders, who split tournament games vs. Azusa Pacific last season, also have played tournament games in Las Vegas and Turlock, which are a few hours drive from home. First, she’s looking forward to her final season with the Cardinals. Santa Fe 65, Foothill 53 — Donny Risper and Matthew Corona both had 22 points to lead the Chiefs to the Coyote Classic Tournament victory. Los Alamitos 52, Whittier Christian 44 — Justin Osborn had 15 points and seven rebounds and Nico Albertini had nine points and five rebounds for the Heralds in a Buena Park Tournament loss Monday. Jake Williams and Eric Sheets both had six points for Whittier Christian. La Mirada 73, Jordan 60 — Shermar Morrow had 23 points and 16 rebounds and Daniel Cabrera and Bryce Craver both had 11 points for the Matadores (1-0) in a Canyon/Esperanza Tip Off Classic victory Monday. Whittier Christian 50, San Dimas 24 — DaShell Vasquez had 16 points, Christa Evans had 11 points, eight rebounds and four steals and Joleen Corona had seven assists for the Heralds in a La Habra Tournament victory. St. Paul 67, Garfield 18 — Valerie Godinez had 17 points and Francesca Facchini scored 14 points for the Swordsmen (1-0) in a South El Monte Tournament victory. California 3, Colony 3 — Andrea Paniagua, Elvia Villagomez and Lezlie Guerrero each scored a goal for the Condors (0-0-1) in a nonleague game. Goalie Angelica Guerrero had three saves for California. Crean Lutheran 3, Whittier Christian 1 — Freshman Aaron Hernandez scored a goal with an assist from senior Matthew White for the Heralds in a nonleague loss Monday. And then there was just La Mirada, which was the area’s lone survivor in the CIF Southern Section semifinals. 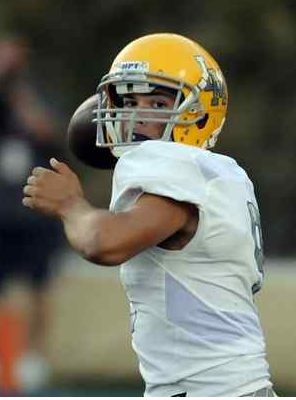 The Matadores advanced to the title round for the second consecutive year, beating Los Alamitos, 36-20, in Division 2. The rest of the area’s final four wasn’t so fortunate. La Habra was unable to stop Murrieta Valley, which scored a 63-42 victory in Division 2. St. Paul lost 21-7 to Norte Vista in Division 7, with Montebello losing, 42-7, to Valley View in Division 11. LA HABRA — Murrieta Valley High School gave up nearly 500 yards and six touchdowns Friday. But with an offense that was unstoppable, the Nighthawks didn’t really care. Hank Bachmeier threw for 319 yards and five touchdowns and Murrieta Valley advanced to its first CIF Southern Section championship game with a 63-42 victory over host La Habra in a Division 2 semifinal. Olita Palmer rushed for 281 yards and four touchdowns for the Nighthawks (11-2), who will host San Clemente, a 41-35 winner over Valencia, in the finals next week. 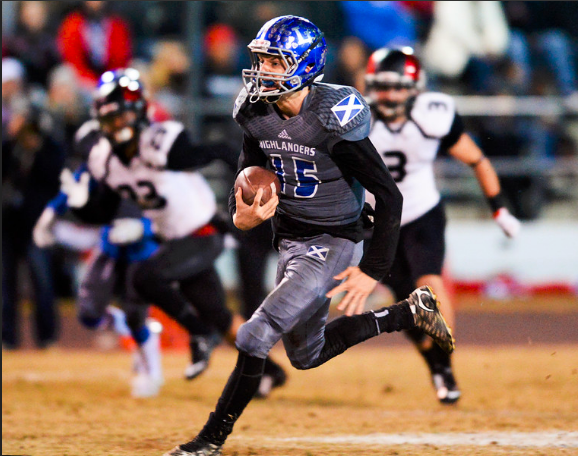 Zach Fogel accounted for 302 yards and four touchdowns for La Habra (8-5), which was looking to get to its second consecutive division final after winning the Southwest Division title last season. The Nighthawks scored on their first nine possessions and finished with 702 yards. Murrieta Valley, which came in averaging 60 points a game during the first two rounds, led 42-28 at halftime. LONG BEACH — The La Mirada football team’s road to repeat continued after a stellar physical performance in the CIF-SS Division 3 semifinals on Friday night. 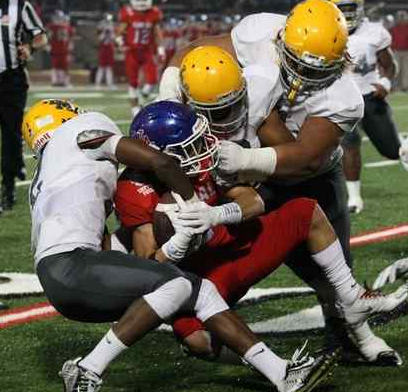 At Veterans Memorial Stadium, the Los Alamitos Griffins pulled out all of the stops, but the Matadores answered the bell each time to pull out the 36-20 victory. The Matadores are headed to their second CIF-SS championship game in a row, looking for their second straight title. “The state championship has always been our goal, but this will be just another stop,” Moschetti said. La Mirada used its ground-and-pound offense led by running back Nick Hernandez, who wore down the Griffin defense. Hernandez had three touchdowns on the night including a 3-yard plunge to put the Matadores up by 16 and seal the victory late in the fourth quarter. Hernandez was playing with dislocated ribs in the game. RIVERSIDE — St. Paul was unable to find the balance it was looking for. The Swordsmen were limited to just 62 yards in the first half of a 21-7 loss to Norte Vista on Friday night in the CIF Southern Section Division 7 semifinals. Nick Redick gained 93 yards to surpass 1,000 for the season for St. Paul (6-7), but it wasn’t enough as Norte Vista’s Eric Melesio ran for 249 yards and three scores. St. Paul’s offense was slow to start, going three-and-out on its first two drives and held without a first down until its third possession. Cody Cardenas had a pair of pass completions as the Swordsmen started to mount a drive late in the second quarter, but was sacked for a seven-yard loss before being forced to punt. Trailing 14-0, the Swordsmen finally scored midway through the third quarter when Alfredo Reyes connected with Martin Carradero on a 10-yard touchdown reception. Melesio, a 5-foot-9, 170-pound senior, rushed for touchdowns of 5, 1 and 3 yards for Norte Vista (11-2), which moves on to the Division 7 championship game next week. MORENO VALLEY — Montebello’s 10-game winning streak came to a screeching halt on Friday night when the Oilers were overpowered by Valley View 42-7 in the semifinals of the CIF Southern Section Division 11 playoffs. Montebello, which made the playoffs for the fifth consecutive season, struggled to find its potent offense that led it to the semifinal game and narrowly escaped the shutout by scoring a touchdown from the 1 with 11 seconds to play. Valley View wasted no time taking control of the game, scoring four times in the first half while holding Montebello to only 35 yards of total offense.